As mentioned in the original white paper, the network relies on pay-in and payout brokers to facilitate near instant payments with any fiat or cryptocurrency, and near-instant merchant payouts into any fiat or cryptocurrency. What follows is a more detailed description of how the system operates along with the fees that are present. Pay-in broker takes a certain amount or risk accepting the cryptocurrency of payment while quickly releasing GRFT in exchange (without waiting for the cryptocurrency of choice confirmations). This risk for broker is mitigated by relatively small(er) retail transaction amounts and is subject to the authorization sample validating the transaction across originating currency network. The risk for the merchant is mitigated by a GRFT bond transaction equal to the amount of pay-in, which is generated by the broker at the beginning of transaction. The bond is put on hold by the authorization sample until the broker approves the altcoin payment to the merchant. As soon as the altcoin transaction (from buyer to the broker) is received and validated, the authorization sample approves the payment to the merchant and releases the GRFT payout (from the broker to the merchant). The broker is able to set different limits for different amounts / history and risk levels. 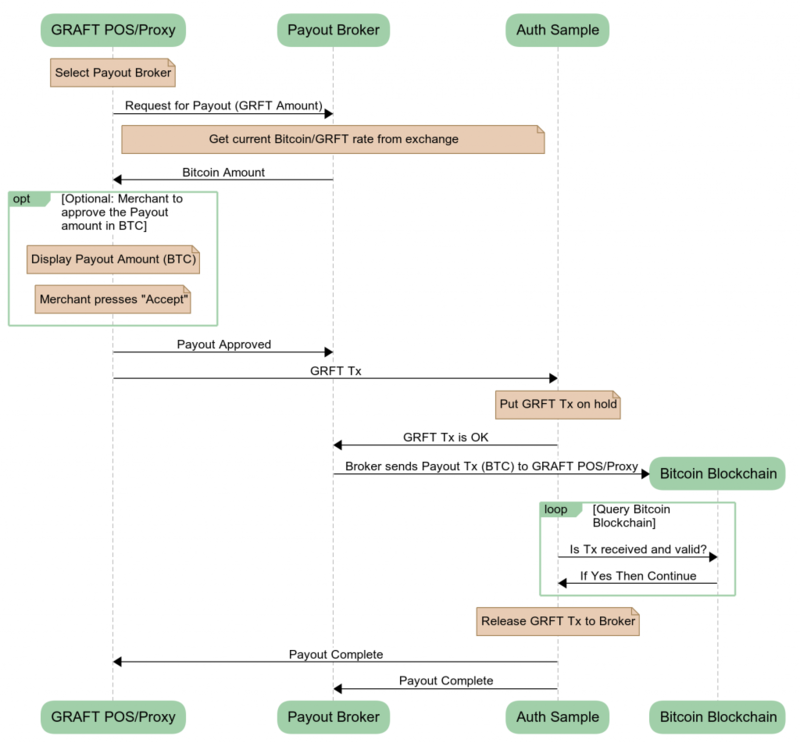 In exchange for this service, the pay-in broker substructs 0.25% exchange fee from the GRFT payment to the merchant, while the supernodes participating in the authorization sample charge their standard GRFT transaction fee (0.5%). 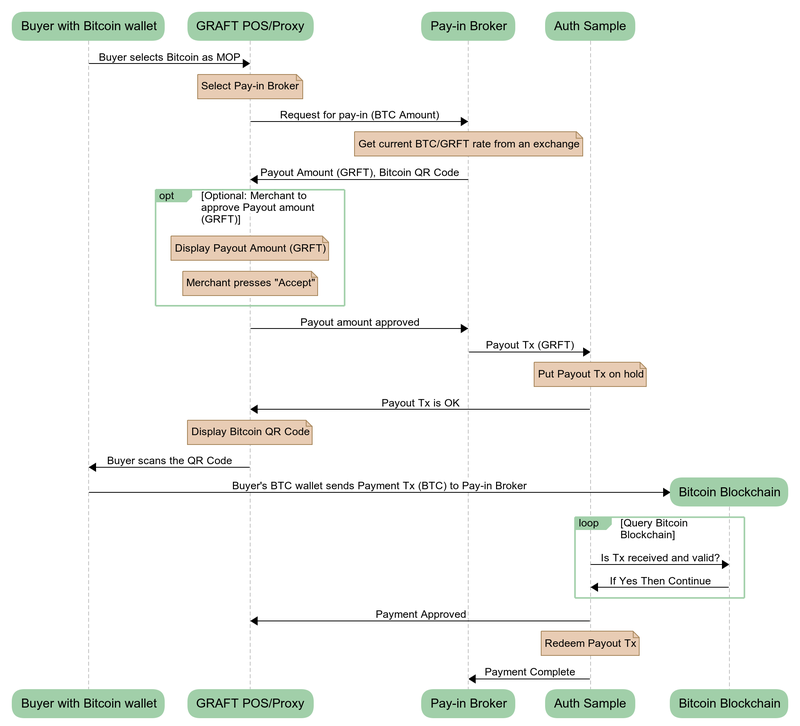 The following flow (sequence) diagram shows how bitcoin acceptance pay-in broker performs the exchange transaction and accepts bitcoin payment on behalf of merchant point of sale. The buyer can use any wallet supporting bitcoin. The merchant receives payout in GRFT. Payout broker exchanges GRFT into the payout currency of choice as requested by the merchant. The transaction is asymmetrical – meaning that the second leg of the payment is usually longer (sometimes much longer) to settle on the receiver side. To make sure that the payout broker delivers the payment with no double-spending, the broker stakes a bond with amount equal to the amount of the transaction. The staking is done by putting on hold the GRFT payment from the merchant by authorization sample. If authorization sample detects (after the grace time) that the payout funds weren’t received by the merchant, it cancels the transaction and payout broker does not receive the GRTF payment from the merchant. In exchange for this service, the pay-out broker receives 0.25% exchange fee. In addition, the authorization sample supernodes charge their regular transaction fee (0.5%). Same exchange brokers can (and most likely will) alternate as a pay-in and payout brokers. For example, let’s review Bitcoin Exchange Broker (EB) which wants to perform both pay-in and payout exchange operations. The broker has a Bitcoin wallet with 0.01 BTC in it. The broker receives a payout request from a merchant to exchange 100 GRFT to 0.01 BTC (assuming the current exchange rate is 0.01 BTC = 100 GRFT). The flow of such payout transaction between the broker and the merchant is shown in the diagram below. The broker accepts the request and sends 0.01 BTC (minus bitcoin network fee) to the merchant, while the merchant generates the 100.75 GRFT payment (100 GRFT amount + 0.25 GRFT broker fee + 0.5 GRFT authorization sample fee) to the broker and transmits it to Authorization Sample. The sample puts 100.75 GRFT transaction on hold and notifies the broker who then sends 0.01 BTC to the merchant. Upon BTC transaction settlement (10-60 mins for the sake of argument and depending on the bitcoin network fees), the 100 GRFT transaction is released and the exchange broker now has the 100 GRFT payment plus 0.25 GRFT profit. The broker can now switch into the pay-in broker mode. As pay-in broker, the EB receives a request to exchange 0.01 bitcoin into 100 GRFT. The broker accepts this request and transfers 100 GRFT (minus fees). As soon as 0.01 BTC is received, the broker is able to become a payout broker again and now has 0.01 BTC and 0.25 GRFT profit. Assuming (conservatively) that a single pay-in/pay-out cycle takes 1 hour, the broker can make around 12% in a single 24 hour period (without compounding), making for a lucrative business model for the Exchange Broker* (*estimation only). The system described above can function beyond the GRAFT intended payment ecosystem and extend into a real-time decentralized exchange (DEX). Due to the fact that the untrusted exchange operations (atomic swaps) are close to real-time to the outside entity leveraging the GRAFT authorization/validation layer (the network of GRAFT supernodes), the same atomic swaps can be extended to provide real-time exchanges, such as BTC<->ETH.